Kamini’s musical journey started in central India with her mother Uma Natarajan. She started learning intricacies and nuances of Indian Classical Music since she was 6 yrs old. She would spend hours coming up with various improvisations at different time signatures. At the age of 10, Kamini started training under one of the most loved and respected musicians of India, Pt. Krishna Kant Shukla and Shri Rajeev Sharma. She graduated in Vocal music and was on Top position at her University. After years of rigorous training, Kamini started performing at various National level music festivals and her performances were adjudged as “Outstanding” by experts in the field. Kamini was one of the youngest graded artist from All India Radio, Indore (India). She regularly appeared in National Television of India. After moving to Los Angeles area in 2002, Kamini collaborated with various music producers and composers of different genres and recorded and performed live. Her song “Devi,” a World Music composition is featured along with Anoushka Shankar and Talvin Singh on the “Tantra Lounge” album. 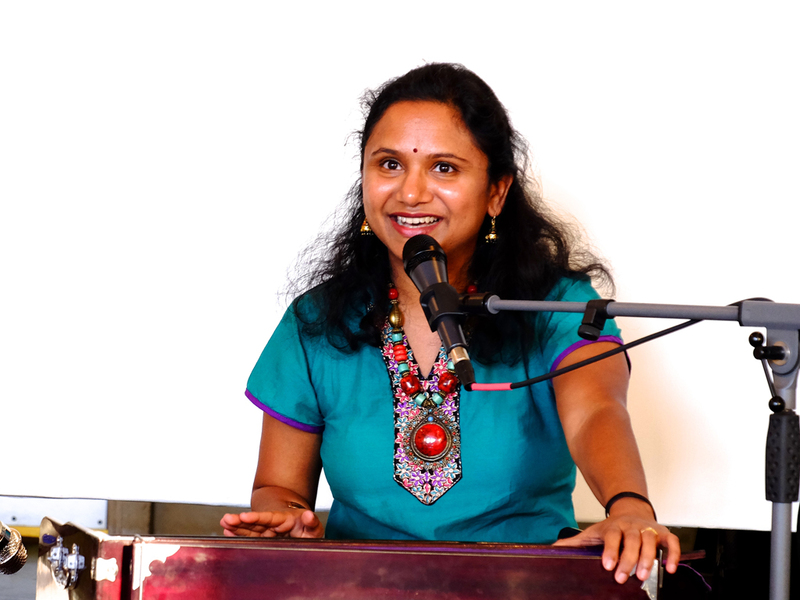 Kamini’s versatility and deep knowledge in music allows her to easily sing and improvise over wide genres of music. Recently she has lent her voice for a song “Karma” in a Rock music album with Michael Cutting. Her latest Music Album Chants for Meditation with Music Composer and Producer Ken Elkinson has been extremely successful and received rave reviews from fans of New Age, World and Yoga Music. She has collaborated with musicians of different genres : Rock, EDM, Armenian, Persian and Jazz. She has performed at lot of Big Music Festivals across California and world wide: Modesto Unplugged Music Festival, Carlsbad Music Festival, One Love Experience Festival, Veda Mela etc. She has been one of the first Indian Classical singers to perform at some of these events. Audience who listen to her for the first time are enthralled by her angelic voice and mesmerizing performance. She also regularly performs at wellness, vegan-vegetarian, green and holistic expos, retreats, and music festivals. Kamini currently lives in Simi Valley, CA. She teaches Indian Classical Music, performs and records. She plays Indian Classical music as well as devotional, Kirtan music. She is the organizer of Simi Valley Kirtan MeetUp Group. Kamini frequently performs in Southern California area and is much sought after Kirtan Artist. Her command over intricacies of Raga and her soulful voice leaves audience mesmerized and asking for an encore. Her music is spiritual, mystical and simply engaging. She incorporates intricate Ragas and traditional rhythm patterns – “Taals” and lifts listeners into a higher state of consciousness- a state of pure bliss, away from day-to-day stress. To learn more about how Kamini can help you, please get in touch through our contact page. CLICK HERE. To learn about Kamini’s services, classes, workshops etc CLICK HERE. If you would like to attend one of her events CLICK HERE. Was in top position in University while graduating in Music. Graded singer from All India Radio, the National Radio for India, for “Sugam Sangeet” at the early age of 16. Selected for Sur-Shree award Jaipur,India from MP where the performance was rated as “Shershta,” meaning outstanding. Won an open national level competition in Delhi for Bhajans and Classical Music. Have given many performances on Television(India) .